I’ve been rafting before, I’ve been camping before, but I can definitely say I’ve never had such a great time as I did this past weekend on the Hudson. I’ve never been, but I’d heard a lot, and I must say I was pleasantly surprised. I woke up on Friday, checked the weather forecast and saw that it was going to be raining. I wasn’t happy about that forecast, but I was definitely optimistic that it wasn’t going to ruin my weekend. After all, the weather is more often wrong than right! As it turned out, that same rain would end up making the trip that much more epic! New York had one of its snowiest winters in years. And as a result, the water levels this past spring have been enormous! And the first weekend of summer was no exception. Add to that all the rain we’ve been getting and we’re talking about 4-6 foot waves on the river. Not too shabby, I’d say. So the rain I was worried would ruin my weekend actually MADE my weekend. Our trip leaders, Mike and Sussman, both agreed that this was one of the best weekends of the year. Camping, grilling, chillin over beers by the campfire, volleyball till all hours at the lit court, it all made for a great time! 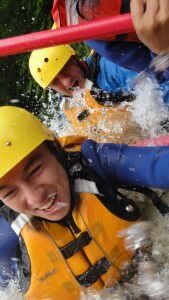 Seventeen miles of paddling on intense rapids, the surfing was incredible! The only disappointment was that we couldn’t do the infamous Otter slide, which has become OvRride tradition. We’re still the only commercial group to have gotten the privilege to run it (twice, in fact,) even though many of the river guides haven’t gotten the chance. The levels were actually too high this past weekend, and doing the Otter would have been reckless. But the way I see it, it just gives us something more to look forward to in July. Next rafting trip will be 8/19-8/21… will you be there?